To make money with a website, you first must create one. Once you have a Blog or a Website, you can start learning how to make money with this website? Making money with a website is not a myth. It is a reality that you have not discovered until now. In this post, I will show you how to monetize your website to make lots of money online. Turning a hobby blog into an income-generating asset is the best way to make extra money online. At the very least, you should be able to make enough to cover your domain, hosting, and training expenses. Many of us making a Rich Living from a website, you can too if you have one. If you don’t have a website, then you can learn How to Build a Free Website to Make Money Online. Hi! This is TQ. Here’s my profile. I have been building websites to make money online for over a decade. I have successfully made lots of money with website. I’ve written a guide to show people ste-by-step ‘How To Make Money Online‘ with a website. 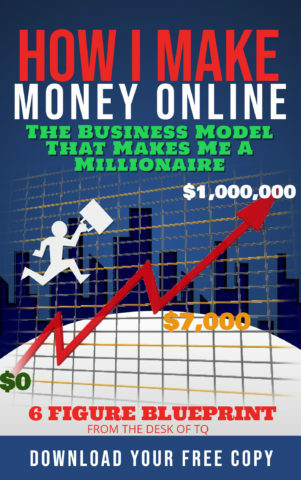 You can download this guide to help you start making money with you website. The strategies to make money with a website listed here, some are easy and some require works. You decide which opportunity is right for you. The most important thing is making sure to pick a strategy or strategies that are relevant to the content of your website and style. Affiliate Marketing is considered the most popular and lucrative method to make money with a website. This industry is forecasted to reach $6.8 Billion by the year 2020. 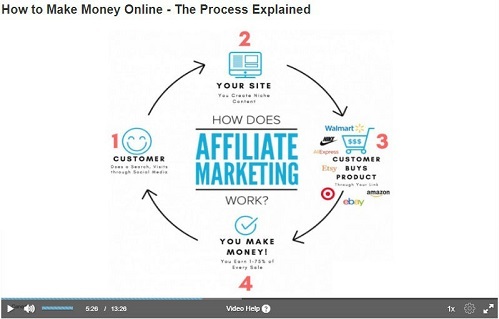 Below is the explain the process of making with a website through Affiliate Marketing. Affiliate marketing is a business strategy used by bloggers and website owners to partner with businesses to earn a commission by promoting the businesses’ products or services on a website through affiliate links. When someone clicks on the link and make a purchase, they earn a commission. The commission can be anywhere from 30% to 70% per transaction. It’s a very lucrative strategy to make money with a website. To become a successful Affiliate Marketer, there is a little learning and practice. You can use these 10 FREE LESSONS to get started. I have used the same lessons to monetize my website. Be careful when selecting the affiliate programs to join. Always choose the top and leader of the industry. It’s smart to join several programs so that you have a variety of products or services to promote and make money with your website. The simplest way to find affiliate programs is to join an Affiliate Network. An affiliate network is a marketplace that bloggers or website owners use to find and participate in affiliate programs. There are many affiliate networks available online. The biggest one is the Clickbank Marketplace. You can visit the website to find hundreds of affiliate programs to join. Yes, Google pays you for letting them place ads on your website. This is probably the easiest method to make passive income with a website. Adsense allows publishers to make money by joining Google’s advertising network. Joining an advertising network system is very simple. You do not have to do anything. Once you join the network, Google places codes on your website to identify the site’s content and start displaying relevant advertisements. You make passive income each time someone clicks on the ad. The only requirement to join ads networks is: You must have a Website! So, build a Website before sign up. Visit SiteRubix to create a free website for your business. You can make a lot of money with a website if it has a high volume of traffics. Online ad networks pay anywhere between $0.50 to $5.00 per impression. A website with 100,000 visitors a month can generate up to $500 per month passive income. If you plan to use this strategy to make money with your website, I suggest you learn how to increase traffics to your website. You can sell ad space on a website directly to companies looking to sponsor different websites or blogs. How much you make with a website from selling ad space depends on the amount of traffics. Normally, sponsors require a minimum number of traffics before sponsoring a website or blog. While this number varies, a website with more than 10,000 unique daily visitors is a good starting point. The market is very competitive when selling your own ad spaces. There are more websites want to sell ad space than the number of sponsors. You need to be able to convince advertisers that your site can deliver a high volume of targeted customers to improve their conversion rate. Conversion is what most sponsors want. An important point to remember, selling your own ad spaces will net you a bigger profit, but it also requires more works. Making money with a website selling your own ad space is competitive, but not impossible. With the right information and skills, you should be able to make a lot of money using this strategy. I suggest you read this blog 6 Ways to Sell Ad Space to learn more. Selling your own products or services on a website have the potential to make you rich, just look at Amazon. This option to make money with a website is not as difficult as you might think. In the past, it took a team of professional webmasters to design a well functional e-commerce website together with a team of back-end workers to process orders. No more, you don’t even have to know codings and HTML to sell online. Sites like Shopify or SiteRubix allow you to create a fully functional e-commerce website with a few clicks of a mouse. Your order processing can also outsource as well. This e-commerce platform will handle everything for you if you want to sell online. 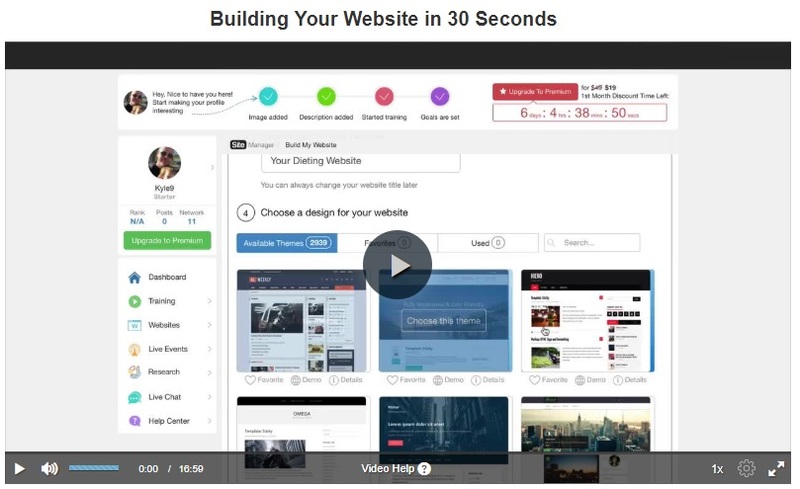 Here is a video demonstrating how you can create a website to make money online in less than 1 minutes. To find out how to make money with a website selling your own stuff, I suggest you use Shopify to build and launch your own eCommerce business website. This is how non-profit organizations make money with a website. Just Ask visitors and supporters to donate through the website. It is simple as that, just ask. To accepting donations on a website, just add a PayPal donation button. It only takes a few minutes to add this donation button to a website and offer visitors a quick way to donate and support your organization. Every Business needs data and new leads to promote and sell their products or services. You offer them the new sales leads and earn a good payday. Basically, you are just connecting the buyers with the sellers. As a matchmaker, you earn money doesn’t matter if the buyers purchasing any product or not. Sellers are willing to pay you for just an introduction. You can make serious money with an email list. But before you can email anyone, you have to collect the email address first. The power of an email list is that you have direct access to the people on the list. You can get your message straight into their inbox. If you want to make a lot of money, then start asking visitors for the email address. Believe it or not, there are hundreds of professional web builders making a full-time living doing just this, Selling Websites. You can use your design skills to make money with a website by selling it. You build a blog or an eCommerce store then sell it to investors. Let’s be honest here, the potential of making money from a successful website is huge. You can potentially make millions. Do you think you want to flip something like this? It is common for companies to pay bloggers to write a review or highlights of their products. This is also known as target marketing. The companies get exposure to a specific target audience or fans from a website, in return, the bloggers or owners make money writing the sponsored post. You earn anywhere from a few hundred dollars to a few thousand dollars per post depending on the popularity of the website. When making money with a website through sponsored posts, remember to follow the FCC requirements on affiliate disclose. It is very important that you follow the Federal Rules and Regulations if you decide to write a sponsored post. Read Are You In Compliance With FCC? to learn more. You can create incredibly valuable content and offer to visitors on a monthly subscription service. Premium content can be anything of value to visitors such as gaming strategies, online training courses, stock investment tips, business consultant, real estate investment or relationship coaches. This website monetization strategy is mostly used by industry experts or online training programs. If you possess a wealth of knowledge in a professional subject matter, you can make a lot of cash by selling content. These are some of the top strategies for you to make money with a website. This is just the tip of the iceberg. It is all up to your creativity. Just keep your eyes out for new opportunities to make money with your website. Now, you know there is a HUGE opportunity for making money with a website, but if you don’t have a blog or a website what can you do? Everyone started out as a novice, including me. I started my online business with these 10 Free Lessons from the Wealthy Affiliate. Over the years, I have made a lot of money with my website. Here’s my profile. One thing I must tell you is to become successful at making money online, you must be willing to learn. If you want to learn how to build a website and make a full-time income online, I like to invite you to try this #1 training program by following the link below. This FREE training program has taught me how to make money from a website, over $7,000 a month. Use this program to build your own website to make money online. You do not need to be a techie to make money with a website. You just need to be WILLING & CREATIVE. Hi. I didn’t realize that there are many ways to earn money online. It’s a new area for me to learn. But the promise of being able to work anywhere with just my computer as my tool sounds very inviting. The Wealthy Affiliate University looks legitimate. We did sign up and we’ll see where that takes us. Thanks for giving us ideas on other online income options. You have just made the greatest choice to join the Wealthy Affiliate University. This University offers you all the tools and skills that you will need to be successful in affiliate marketing. 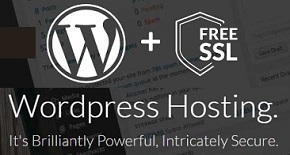 The best part is you get 25 free websites, imagine how much you can earn with this many websites? You can make a lot of money just creating websites. I am doing it right now, so can you. Good luck. This is a great post! There are so many different ways to make money from a website. I love the donation button, it is simple and there are many places to install one. I also like the idea of flipping a site, if you know what you are doing that is a great way to make some good money. You have just given me some ideas, thanks so much! I am just giving you a fraction of all the opportunities you can do with your website. The website is your most powerful weapon to make money online. Your creativity will take you further into success. I am grateful that I can share with you this wonderful journey. I am interested in affiliate marketing however how much is the potential? And can a regular person make a living? Let me tell you right now, do not listen to what people say about affiliate marketing. This industry is in its infancy stage. Remember this, when you are going into business, follow the industry leaders. Look around you, Amazon, Walmart, eBay, and many more online retail leaders are embracing affiliate marketing. This should give everyone a hint a big title wave is on its way. Do you remember the early day of online retail? How many people would have thought that Jeff Bezzo of Amazon will be the world richest man? How many would have thought online retail would kill department stores? Should I go on? Mr.Furkan, I hope you see the potential of affiliate marketing. It is a force to be reckoned and all industry leaders are on board! I want to be with the leaders. Get on the wagon of success, if you want a piece of $6.8 billion dollars and growing. These are truly the legit ways to make money online, especially affiliate marketing which is what I am getting into right now, better than all those fake scammer sites with empty promises. Affiliate marketing is one of the best ways to make money from your website. I agree with you, this is the greatest opportunity ever. Thanks! These are the ways that full-time online affiliate marketers and I make money from our website. There is nothing scam about this. Every online retail giant is embracing affiliate marketing. To me, the more people are crying about making money online a scam the better, fewer competitions, more opportunities to make money for me. lol. This is why many successful bloggers and affiliate marketers do not want to share this secret at all. Shan, you are on the right path and doing the right thing, do not give in. There’s a lot of easy ways of making money online from the website, and as you have shown it’s not hard! If you don’t have the skill and knowledge, you can learn. I agree there are lot of training programs out there, but not all are the same. Definitely I am going to look into these more. Thanks! The keyword here is learn. Many people are getting online and thinking that they can get rich over night. They do not realize that online business success require dedication and good training. If you are willing to learn, you will make money online. This is the easiest job and I enjoy it everyday.